Restore your curiosity in Granbury. The Downtown Historic Granbury Square is just the start of your small-town exploration. Your getaway awaits all over town. 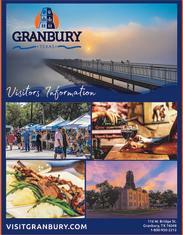 Granbury is home to many cultural, culinary, historic and enriching stops – all perfect for an adventure for the entire family. With live performances year-round on iconic stages, downtown nightlife, many annual festivals and much more, the exploration and excitement in historic Granbury never ends. If you explore the Square and still have some time, some additional Granbury must-stops include the famous Revolver Brewing on a Saturday, a day on Lake Granbury, a movie at the famous Brazos Drive-In Theater, and much more. Stop by the Visitors Center for more information! Load up the car and explore some of Granbury’s and surrounding town attractions without ever leaving your seat! The Brazos Drive-In Theater is a must-see, and it sits just off the Granbury Square. This iconic Drive-In is one of the few left in Texas, and is the perfect family or date-night spot. Catch a double feature on Friday or Saturday nights. Prior to the show, bring some outdoor games for the whole family to enjoy! Just a short drive from Granbury, you’ll find the Fossil Rim Wildlife Center in Glen Rose, Texas. Fossil Rim is a drive-through safari experience, known around the globe for its conservation and restoration efforts, especially with Cheetahs. You definitely won’t want to miss this one-of-a-kind education experience that you can’t find anywhere else! Restore your tranquility in your Granbury getaway. Rest easy from the balcony of one of the many historic Bed & Breakfasts, watch the sunset from the Granbury City Beach, enjoy the Brazos River from the seat of kayak, or explore the peacefulness of a small town from the many hike and bike trails. Your restoration isn’t far away. Are you ready? Restore your joy by running your toes through the sand and kicking back as if you’re on the coast. The Granbury City Beach is a one-of-a-kind destination to complete your Granbury stay, and it’s just a walk off the Historic Granbury Square. On any day, you’ll find both locals and tourist alike enjoying a hot summer’s day, watching the sunrise on the boardwalk, or just enjoying Lake Granbury from the Beach! This is a must-stop on your journey to restoration and relaxation in Granbury, Texas.